He got so many calls, he said, that he was worried he'd start losing business. 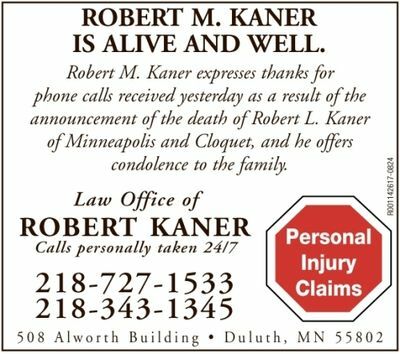 "All those calls from concerned clients and friends," he said, "led me to believe I should announce that I am alive and still practicing law in Duluth." (It is tempting to say that the clients might have been checking to see whether they needed to pay their bills, but I'm sure that's not true.) And as long as you're putting an ad in the paper, you might as well include your contact info and line of work, just in case anybody needs a lawyer. Robert M. also offered condolences to the family of Robert L., as you can see, so it wasn't all business. 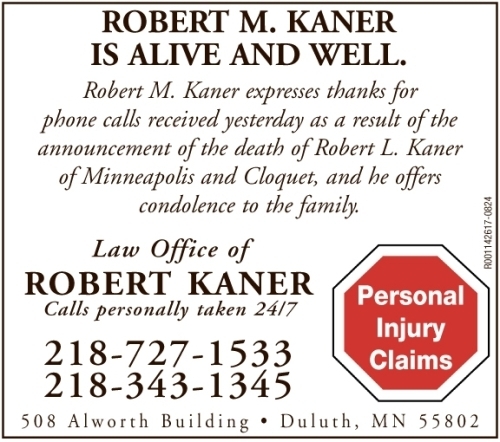 Still, if you would like to hire Robert M. Kaner, who is alive, he can be reached as shown above.